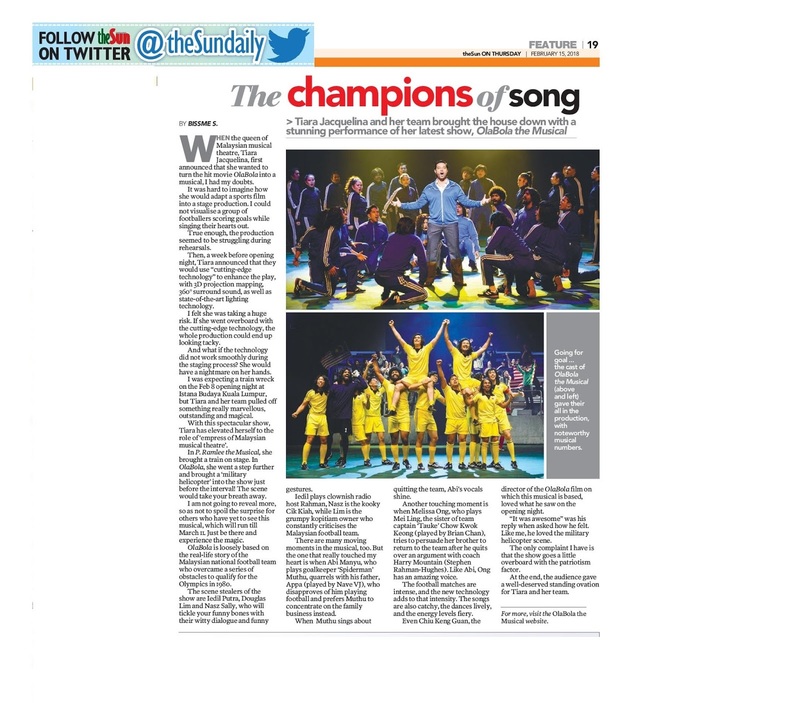 WHEN the queen of Malaysian musical theatre, Tiara Jacquelina, first announced that she wanted to turn the hit movie OlaBola into a musical, I had my doubts. It was hard to imagine how she would adapt a sports film into a stage production. I could not visualise a group of footballers scoring goals while singing their hearts out. True enough, the production seemed to be struggling during rehearsals. Then, a week before opening night, Tiara announced that they would use “cutting-edge technology” to enhance the play, with 3D projection mapping, 360° surround sound, as well as state-of-the-art lighting technology. I felt she was taking a huge risk. If she went overboard with the cutting-edge technology, the whole production could end up looking tacky. And what if the technology did not work smoothly during the staging process? She would have a nightmare on her hands. I was expecting a train wreck on the Feb 8 opening night at Istana Budaya Kuala Lumpur, but Tiara and her team pulled off something really marvellous, outstanding and magical. With this spectacular show, Tiara has elevated herself to the role of ‘empress of Malaysian musical theatre’. In P. Ramlee the Musical, she brought a train on stage. In OlaBola, she went a step further and brought a ‘military helicopter’ into the show just before the interval! The scene would take your breath away. I am not going to reveal more, so as not to spoil the surprise for others who have yet to see this musical, which will run till March 11. Just be there and experience the magic. OlaBola is loosely based on the real-life story of the Malaysian national football team who overcame a series of obstacles to qualify for the Olympics in 1980. The scene stealers of the show are Iedil Putra, Douglas Lim and Nasz Sally, who will tickle your funny bones with their witty dialogue and funny gestures. Iedil plays clownish radio host Rahman, Nasz is the kooky Cik Kiah, while Lim is the grumpy kopitiam owner who constantly criticises the Malaysian football team. There are many moving moments in the musical, too. But the one that really touched my heart is when Abi Manyu, who plays goalkeeper ‘Spiderman’ Muthu, quarrels with his father, Appa (played by Nave VJ), who disapproves of him playing football and prefers Muthu to concentrate on the family business instead. When Muthu sings about quitting the team, Abi’s vocals shine. Another touching moment is when Melissa Ong, who plays Mei Ling, the sister of team captain ‘Tauke’ Chow Kwok Keong (played by Brian Chan), tries to persuade her brother to return to the team after he quits over an argument with coach Harry Mountain (Stephen Rahman-Hughes). Like Abi, Ong has an amazing voice. The football matches are intense, and the new technology adds to that intensity. The songs are also catchy, the dances lively, and the energy levels fiery. Even Chiu Keng Guan, the director of the OlaBola film on which this musical is based, loved what he saw on the opening night. “It was awesome” was his reply when asked how he felt. Like me, he loved the military helicopter scene. The only complaint I have is that the show goes a little overboard with the patriotism factor. At the end, the audience gave a well-deserved standing ovation for Tiara and her team. For more, visit the OlaBola the Musical website.